Quadruple or Nothing: An Introduction to Hermetic Number Theory. “Much human ingenuity has gone into finding the ultimate Before.The current state of knowledge can be summarized thus: In the beginning, there was nothing, which exploded.” -Terry Pratchett, Lords and Ladies. For as long as we have record, humanity has placed a rather special emphasis upon numbers in one way or another. Four Horsemen, Twelve Apostles, Seven Gates of Thebes, etc. Occultists are no different in this regard. Now, a large portion of Hermetic theory comes from ancient philosophers like Pythagoras, Parmenides, and Plato. Plato’s Timaeus was particularly important in establishing a cosmology centered around the sanctity of numbers, elements, geometric forms and divine emanations. His later admirers, such as Plotinus, Porphyry and Iamblichus, took things even further. But to get a really good grasp of how numbers became viewed as mystical things, lets start at the beginning, and I mean the very beginning, with Nothing. At least, we’ll call it Nothing. Ultimately, we’re talking about the state of the universe before creation, before the Big Bang, before anything that could even be called a Something came about. 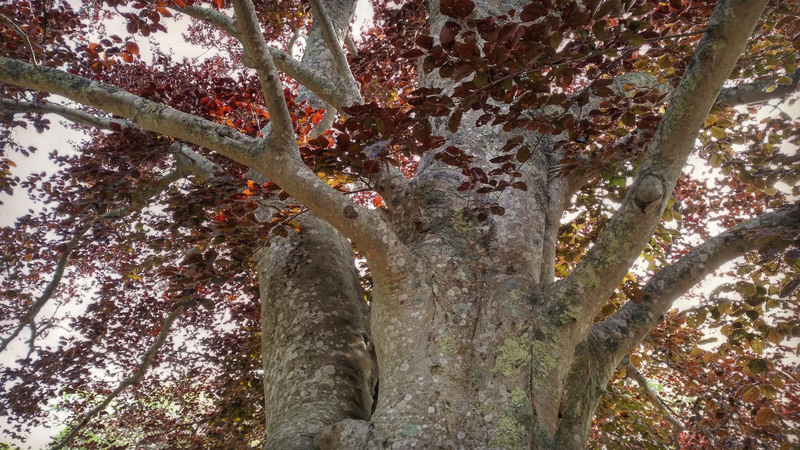 We call it Nothing for convenience, but frankly, our minds have a lot of trouble with Nothing, since even our conception of Nothing is still Something. Eventually, however, Nothing indeed became Something. One. The first inkling of creation. That miniature speck. That ultimate unity. The Monad. The seed of the entire universe, contained within a pin-prick. However, our Monad could not remain as merely One. It might as well revert back to being Nothing, since an ultimate unity containing everything would still lack distinction from anything else. Therefore, our One had to notice that it was something other than the something from which it came. The Monad awakened, then, and became self-reflective. A Dyad was thus generated. Though the initial Monad was perfect in every way, it could not create an exact replica of itself. Number Two just had to be a different kettle of creation, even if only slightly, else it would merely be a case of the One interacting with itself. Instead, One became Two. Or, geometrically speaking, the Point became the Line. Conveniently, the moment the Dyad was created, everything else in the Universe pretty much followed suit almost immediately. Allow me to elaborate. The moment something has Two points, it instantly also has a Third, since there must automatically be a mean, or halfway-point between the Two, that may act as a perfect point of balance. When that balance point expands, something magical happens. Behold, the Triad. Ever wonder why the “Third time’s a charm?” Or why doing something three times “makes it stick,” so to speak? “Trinities?” “Triple Godesses?” “Thrice Greatest?” They all come back to our pal the triangle. The ancient philosophers believed that all creation was dependent upon sacred geometric properties. The Triangle is the first and simplest of all polygons, and is used to create all of the others. 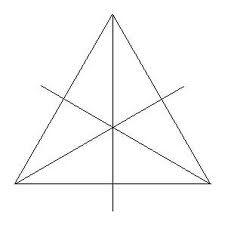 Two Triangles make a Square, Three make a Pentagon, etc. Thus, the number Three became synonymous with manifestation. For One became Two, Two became Three, and Three became the corner stone of creation. 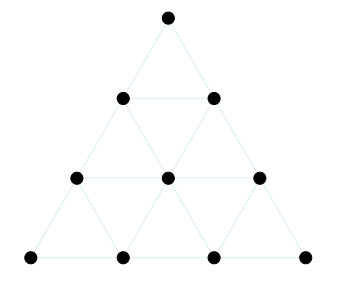 In addition, each triangle thus created could be split a theoretically infinite number of times, creating a theoretically infinite number of triangles. However, our ancient philosophers knew that a flat world was a boring world indeed. Our two-dimensional polygon of three sides needed some depth. Enter the Tetrad. Number Four. The sacred. The holy. Now in glorious 3d! Why was Four such a big deal? Because not only did it represent the culmination of the “divine mind” finally achieving a 3-dimensional state (thus becoming a true building block of our gloriously lumpy universe), but because the sacred Ten – the number (usually) of the first digits we ever used to count with, which all of the other numbers greater than Ten are based upon – is found within the Tetrad. You see, when the number Four unfolds, it becomes the Tetractys. 1 plus 2 plus 3 plus 4 equals 10. The pattern, in perfect symmetry, folds out into the first polygon, the cornerstone of creation, made from the numerical key of the cosmos, i.e. the digits from one to ten contained within the Tetractys, or one through four, symbolic of physical creation from point to line to plane to solid. Also, we cannot forget to mention the 4 elements intrinsic to creation: Fire, Water, Air and Earth. The Four that is Three may also partially be why the number 7 is deemed sacred, though there’s also a bunch of correspondences to the Seven Holy Planets, Seven Stars of the Pleiades, etc. But to really see how these concepts were encapsulated, we must bring alphabets into the mix. Many of the ancient texts revered by Hermeticists were written in derivations of either ancient Greek or Hebrew, and both cultures had based their alphabets upon the earlier Phoenician letters. Initially, none of these cultures had a numerical system separate from their alphabet, so they used letters to represent their numbers. Thus 1, 2, 3, 4 became Aleph, Beth, Gimel and Daleth for the Hebrews and Alpha, Beta, Gamma, Delta for the Greeks. You’ll note that number 4 for the Greeks (and the Phoenicians, by the way) was represented by the Triangle, which symbolized both the 1 becoming 3 and the 4 becoming 10 (when viewed as the Tetractys). Simultaneously, the Greek word for Ten of something, or Deka (δεκα), starts with the letter Delta. Still with me? Now comes the best part. Iota. Ever hear someone say “I don’t give one iota…” of something? Above is where the phrase comes from. Iota is not only tiny, but also the proverbial mustard seed of the entire Greek alphabet (and subsequent language), since every other letter was first written using a series of Iotas. This is even more visually striking when you play with the Hebrew Iota, known as Yod. An initial spark. A tiny candle flame. The first smudge of a paintbrush or calligraphy pen. The beginning of creation. Much like One eventually became Ten, our Ten can now become One again. Dekad becomes Monad and the circle is complete. So, to recap: Nothing became 1, 1 became 2, 2 became 3, 3 became 4, 4 became 10, 10 represented everything in the Universe, and condensed back to One, which might as well be Nothing. Got it? Good.